Steveann Wynn (right), executive director of Share Food Program, is retiring. She talks with volunteer Linda Gerald at the Share warehouse. Steveanna Wynn first saw deep poverty back in her native Narrows, in southwest Virginia. Destitute neighbors in that tiny Appalachian town were sleeping in a rusted-out potato-chip truck, listing on a country road beside a mountain. ‘Tsunami’ of free food for the hungry is coming. Will it be too much to handle? Around the country, incomes are rising. In Philly, they’re falling. 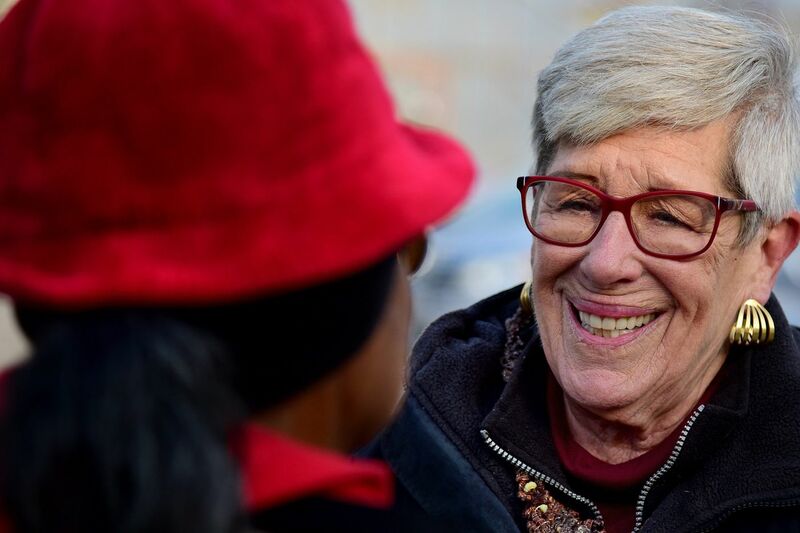 "That's poor," said Wynn, 72, executive director of the Share Food Program in Hunting Park, a multifaceted agency that provides food for around 500 pantries in the city. "And I never forgot it." After 31 years, Wynn is leaving Share on Nov. 30. Word of her retirement shot through the anti-hunger community in Philadelphia like one of those dreaded can't-be-true rumors, the disbelief palpable. Among those who battle hunger for a living or a cause, Wynn is a mentor and patron saint, a caring, straight-talking, Maker's Mark-imbibing mega-advocate whose Southern-accented voice, made rough by too many cigarettes, can slide from honeyed hellos to profane tirades, depending on the circumstance. In a profession where people regularly burn out, Wynn has burned on, steady and bright, because, she said, "I have to make sure people do not go hungry in this city." With the vision of Virginia mountain poverty etched in memory, Wynn has collected food that has fed millions. In the Share warehouse, she herself has moved uncountable tons of goods with the skill of a balletic Teamster helming a purple forklift. Steveanna Wynn in a 2012 photo moving food boxes with her forklift. She oversees about 25 employees and an astonishing 2,000 or more volunteers a month. Every growing season, the urban farm she cut into the dirt next to her warehouse yields thousands of pounds of produce. Wynn disburses free commodity foods from the U.S. Department of Agriculture and manages much of the money the state earmarks for the city to feed people in poverty. In anticipation of a Katrina-like catastrophe striking Philadelphia, Wynn has these past years been the USDA-designated leader who would be in charge of feeding every one of us as the coordinator of emergency food. Over the decades, she's made herself indispensable, those who help the needy say, a key weaver of the safety net that stretches, fraying and thin, beneath people in poverty. "She is a giant in this field," said Sandy Sherman, director of nutrition education at the Food Trust, a nonprofit that promotes healthy food. "She is the bedrock of our food system in Philadelphia." Wynn is leaving the job she once swore she'd never give up because her former daughter-in-law killed herself last March, and Wynn wants to help her son and three grandchildren in Nashville. "I thought I'd never retire. I thought I'd die here at my desk. But …"
Advocates have told Wynn they're waiting for her to rescind the retirement, issue a "just kidding," and allow them to sleep soundly again. "People believe I'll be back," Wynn said, crying. "Leaving is harder than I thought. But this is permanent." "We're lucky to have worked with a legend," said Paula Schaefer, administrator of the MontCo Anti-Hunger Network in Lower Gwynedd. The network is part of Share. "Her wit and manner make her memorable, her passion and determination make her remarkable." "She has taught and trained so many of us," said Mariana Chilton, the Drexel University School of Health anthropologist and anti-hunger advocate. "Steveanna is a wise soul — perhaps the only one — in the Philadelphia fight to end hunger." What people are impressed with most is Wynn's flexible ability to load trucks with onions, meet with corporate donors, then testify before the USDA or fight with the state to get more money for food. "She's the perfect blend of hands-on worker and advocate," said Anne Ayella, former director of community relations at Nutritional Development Services of the Archdiocese of Philadelphia. Asked to recall her favorite interaction with Wynn, Portia Lyles, who runs a food cupboard, did not hesitate: It was the turkey story. "I'd gone to Share to pick up some broccoli around Thanksgiving last year," said Lyles, who runs Triumphant Faith IWC Food Cupboard in Olney. As she spoke with Wynn at the warehouse, Lyles told her that she'd taken off work to get the vegetables and that she'd prayed to God for turkeys. '"You did what?'" Lyles recalled Wynn asking. "I said yes. Then she offered me 150 turkeys on the spot and told me, 'You have the heart it takes to be in this community.' And the next day, she called me to pick up potatoes and cauliflower, too. "I don't know who else has that passion." It's that core belief in helping others that Wynn took with her from Virginia, said Linda Samost, founder and director of Sunday Suppers, a local nonprofit that focuses on low-income families. Wynn helped nurture the organization. Samost said that as a kind of final act, Wynn has coordinated what is being called a "tsunami" of food being released by the USDA. Many U.S. farmers are unable to sell their bounty abroad because foreign nations have retaliated against tariffs imposed by President Trump by taxing American agricultural products. The USDA is buying that food and diverting some of it to the charitable food network. In all, $1.2 billion of pork, apples, and other commodities will surge through the emergency food system. Wynn is making sure anti-hunger organizations receive portions of the federal largesse, estimated to be worth around $60 million in Pennsylvania. It will start to arrive in mid- to late December. Steveann Wynn (left) gets emotional as Virginia Tucker (right), a Share Food Program volunteer for 25 years, wishes her well at the Share warehouse. By then Wynn may well be raising a ruckus in Nashville. "It's more southern than Virginia," she said. "More Baptist, more Republican. I hope not to embarrass my son, but who knows? "I'll probably be out marching in the street for something."